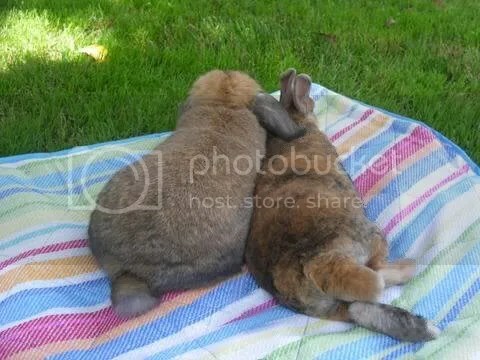 BonBon (RIP) and Snickerdoodle loved to go for walks outside in the grassy area in front of my apt but I think their favorite part was just being in each others’ company under the warmth of the sun. PSA: Bunnies are not dogs. They will not come back if you call their name. Please make sure that if you take your bunny outside you have them on a bunny safe leash or inside an enclosed pen for their safety. Awww, that’s so adorable. My condolences to you for BonBon. Your PSA totally just made me bust out laughing lol. love it! I am sorry for your loss, Bon Bon it is so hard to loose a member of the family. We have a bunny too. She is lop eared and we love her. Was Bon Bon male? Or female? We thought about getting our bunny a playmate, but I don’t know which is best, two males or two females. Thanks for your condolences. BonBon was a male. Usually it’s easier to do a male-female combination then male-male then female-female in my experience. If you are not experienced in bonding bunnies PLEASE do research. Bonding bunnies is a delicate process. If you have a rescue near you, they often will bond bunnies for you if you adopt a bunny from them. Good luck!